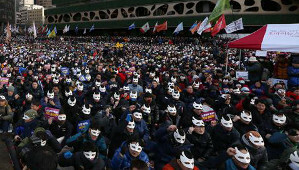 On December 5, an estimated 50,000 working class people gathered again at Seoul Plaza in central Seoul and went ahead a mass protest of People’s 2nd All-out Rally. Wearing white masks to exhibit their contumacy against the government’s ban on mask-wearing during demonstration and warning of arresting all attendants that wear masks, protesters defeated the security police’s every attempt to oppress the rally. The Rally was held in front of the city government office from three o’clock in the afternoon. The president Han Sang-gyun of the Korean Confederation of Trade Unions (KCTU) who has been taking shelter at the Jogye Temple in Seoul since the November rally, said in a video message in the opening, “The peace which our people seeks is not the peace that admits the violence of the state power. We should firmly declare our disobedience to the savage dictatorship of the government. The oppressive government cannot stop our fight. Let’s show them that flowers sometimes turn to weapons”. He called for all attendants to carry out the march in a stately and resolute manner. The leadership of the People’s All-out Rally, which is consisted of workers, farmers, poor people and civic groups, announced its policy to fight a 3rd People’s All-out Rally of nationwide synchronized protest rallies on December 19 in solidarity with the KCTU’s beginning of general strikes on December 16. Workers of the world, Let’s fight together with KCTU!